When considering dining in 2018, there is not anything more timely than examining how the current state of single use dinnerware impacts our lives and our environment. Why celebrate disposable dinnerware? Isn’t it the stuff that is piling up in our dumps and is polluting our water and becoming part of our food chain? For the answer, one must consider the origins of disposable dinnerware. The “original” disposable dinnerware, which was actually the earliest dinnerware, consisted of fallen leaves, gathered shells, and other container-ish objects found in nature. The leaf was created by nature, and after it served its purpose as a dish or a scoop, it was discarded and became food for insects, other animals, or it simply biodegraded on its own. 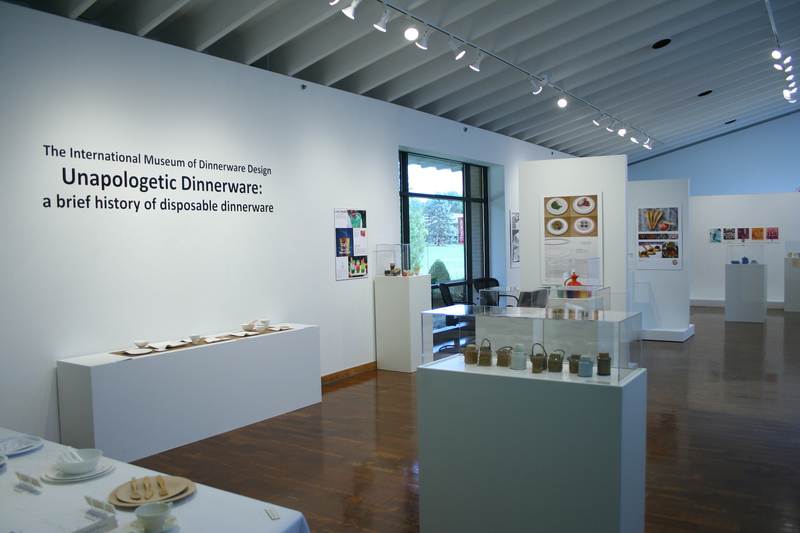 This exhibition curated by the Ann Arbor-based International Museum of Dinnerware Design is not intended to be comprehensive. And it is impermanent in every sense of the word. It is a temporary exhibition on view at the Kreft Gallery at Concordia University in Ann Arbor, from August 28 – October 12th, 2018. It is also impermanent because of the nature of the objects being displayed. It is common for objects in a museum’s permanent collection, to be catalogued and accessioned – given a unique number by which the object can be traced in storage or in a collection database. Most of the objects in this exhibition are not being catalogued because of their own impermanent nature. This includes plates made from fallen leaves, edible cups and utensils, and single use dinnerware made of compostable, biodegradable, and other plant-based materials found in nature. The exhibition Unapologetic Dinnerware provides an exploration into early dishes believed to have been disposable and exposes a significant gap between 4th millennium B.C. Mesopotamia and the early to mid-20th century when disposable cups and straws became ubiquitous. Disposables were first a lifesaving improvement in sanitation and later a convenience. 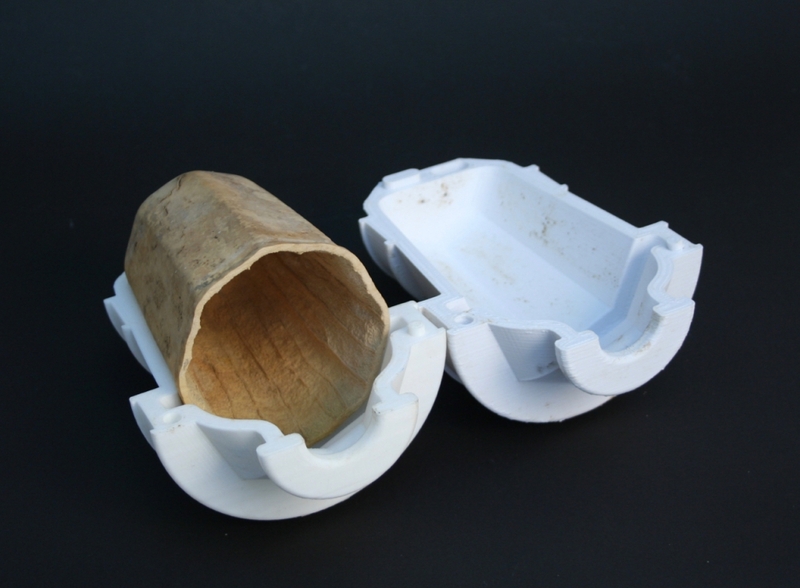 Current innovations are focused on providing earth friendly and even edible alternatives to “disposables” created from plastic and Styrofoam. 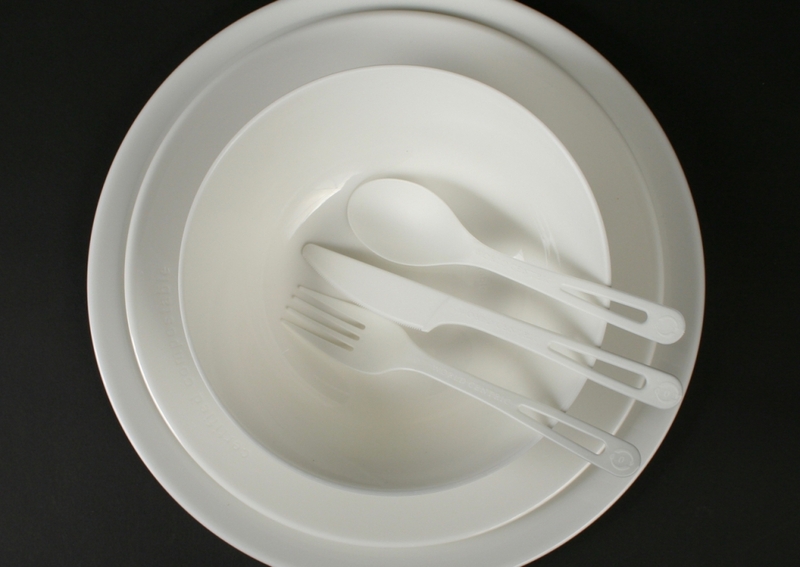 The United States has not been alone in exploring innovations in single-use dinnerware. Included in this exhibition are proto-type designs and single use consumables from India, Jordan, Portugal, ancient Mesopotamia, Germany, Australia, Puerto Rico, Bulgaria, Switzerland, Japan, and Malaysia. The first man-made disposable dinnerware was probably made of clay because clay is available nearly everywhere; pottery is inexpensive; simple bowl forms are easy to make; and it can be fired to a low temperature without too much difficulty. Some ceramic mold-made 4th millennium B.C. 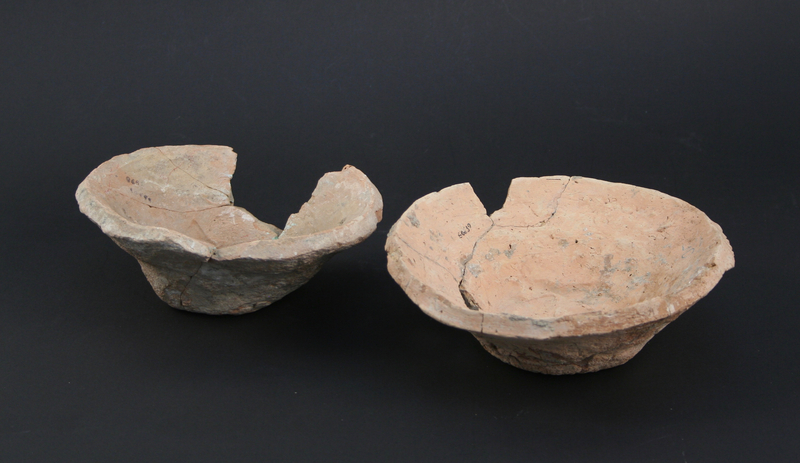 Mesopotamian bevel rimmed bowls featured in this exhibition were possibly disposable. In addition to bevel rimmed bowls from Mesopotamia which may have been disposable bread-baking molds for mass bakeries, the exhibition explores many of the available alternatives to plastic straws. In recent months there has been an active movement away from plastic straws which have been popular since the 1960s. Although the accuracy can be debated, it has been repeatedly stated that more than 500 million straws are used daily in the United States alone. Aardvark Straws in Fort Wayne, Indiana states that paper straws cost about 1 penny more than plastic straws. Some cities like San Francisco have banned plastic straws. While the use of straws may date back to the beer-drinking Sumerians (3,000 B.C. ), rye grass straws have been in use since the 1800s. The modern paper drinking straw was patented by Marvin C. Stone in 1888. 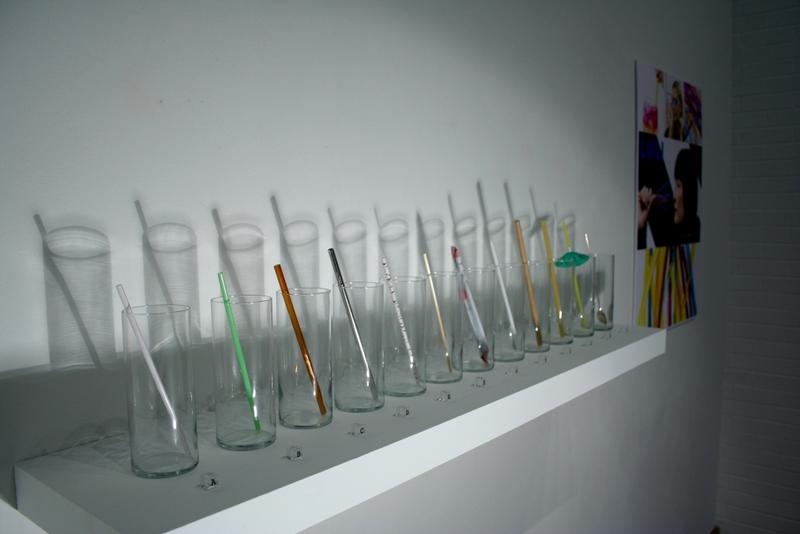 There are alternatives to paper or plastic straws, featured in this exhibition. Included are straws made of straw (wheat straws), handmade in Switzerland; pasta straws produced in Italy and distributed in the U.S. by The Amazing Pasta Straw Company (“use your noodle”); stainless steel straws; glass straws; edible straws by Lolistraw, bamboo, PLA (short for Polylactide) straws made from renewable resources such as plants like corn and beets that are then converted into complex sugar chains through processing into a plastic-like material; and even a fancy leaf-shaped Sterling Silver Tiffany & Co. mint julep straw spoon. If one is old enough, there may be a memory for the Flav-R-Straws that were marketed in the U.S. beginning in 1956. This type of straw, with flavoring inside the straw, is now manufactured in Australia as Sipahhs. No matter the type of straw under consideration, it is easy to draw the conclusion that all straws should definitely only be available upon request when dining out. It is true that many inventions are the result of a need in society. For example, single use paper cups were created to promote good health by curtailing the spread of germs — and then just became a simple convenience. Prior to the creation of disposable paper products, according to the Dixie® website, people were commonly using a community cup or dipper to drink water from public water barrels. People were beginning to learn about germ theory. Smithsonian.com refers to the invention as “life-saving technology.” The Health Kup was invented by Hugh Moore and Lawrence Luellen as a germ free, convenient device. Disposable paper cups have been in use since around 1926. The convenient cup dispenser has been in use since the mid-20thcentury, along with paper plates (http://www.dixie.com/about-dixie). 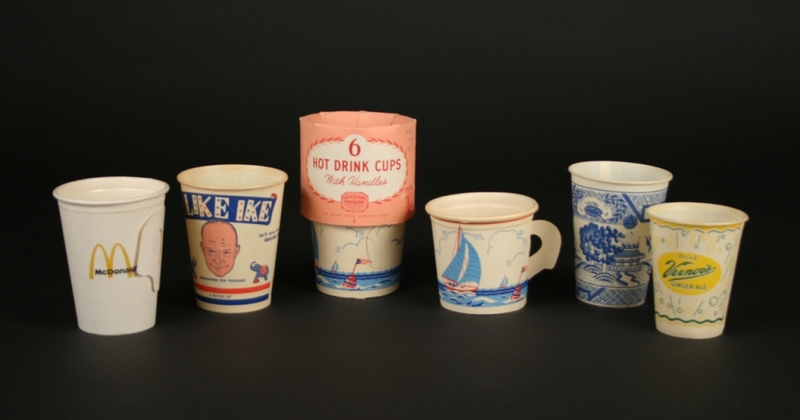 This exhibit includes paper cups featuring “I Like Ike” campaign slogans from 1952; hot drink cups with sailboat motifs and “winged” handles; a Dixie cup from McDonalds featuring their trademark golden arches; a Dixie cup with a truly Michigan product, Vernor’s Ginger Ale; and the ubiquitous “Blue Willow” pattern featured on a pair of Fonda paper cups. Vintage magazine advertisements are displayed nearby. In 2018, many of the single use dinnerware objects manufactured today are being created as a more natural alternative to disposable dishes made of plastic and Styrofoam. 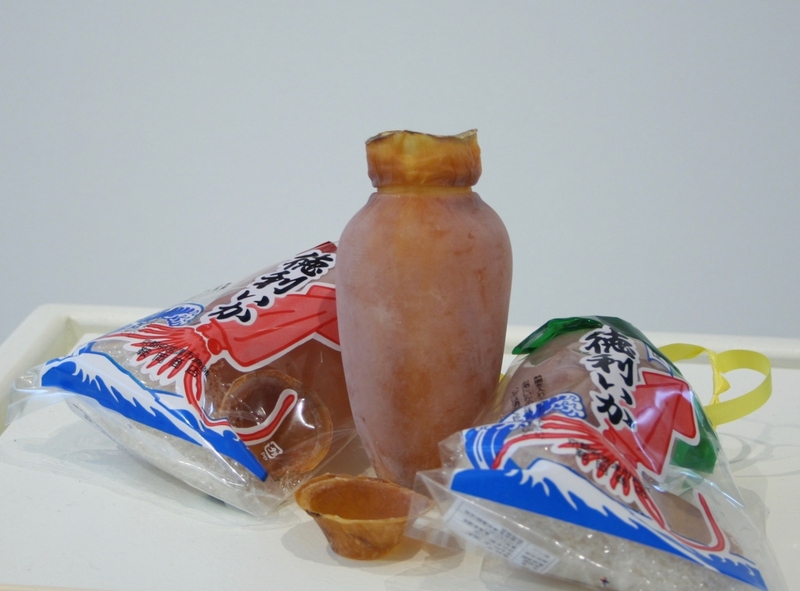 Even basic “dishes” are under scrutiny in this exhibition. In terms of actual single use dishes, there are many choices for the consumer. Once again, the movement is away from dishes made of materials such as Styrofoam and plastics that are harmful to the environment. Manufacturers of these environmentally friendly dishes market their products with terms such as biodegradable, compostable, tree-free, and sustainable. Leaf Republic, located in Germany, notes their one-way dishes, bowls, trays, and plates are made of natural leaves, stitched together; indeed, “fallen” leaves. Alternative materials for disposable dishes include compostable wheat straw pulp, palm leaves, recycled paper fibers, bamboo, sugar cane, and corn starch and talc. By far the most beautiful of the single use dinnerware is WASARA from Japan. Originally designed by Shinichiro Ogata in 2009, the dishes and utensils are manufactured in China from sugar cane fibre, bamboo, and reed pulp. They are deemed by their manufacturer to be biodegradable, compostable, tree-free, and sustainable. With their careful attention to aesthetics, it seems a shame to only be able to use them one time. The exhibition does offer several non-disposable alternatives in the exhibition for comparison sake. On one table, displayed with the single-use dishware, are place settings from Lenox China from the 1930s and contemporary Corelle® Ware by Corning, which is basically three layers of laminated glass. These ceramic and glass alternatives are reusable and durable. They are usually only thrown out if they have been broken and have become shards or splinters of glass. 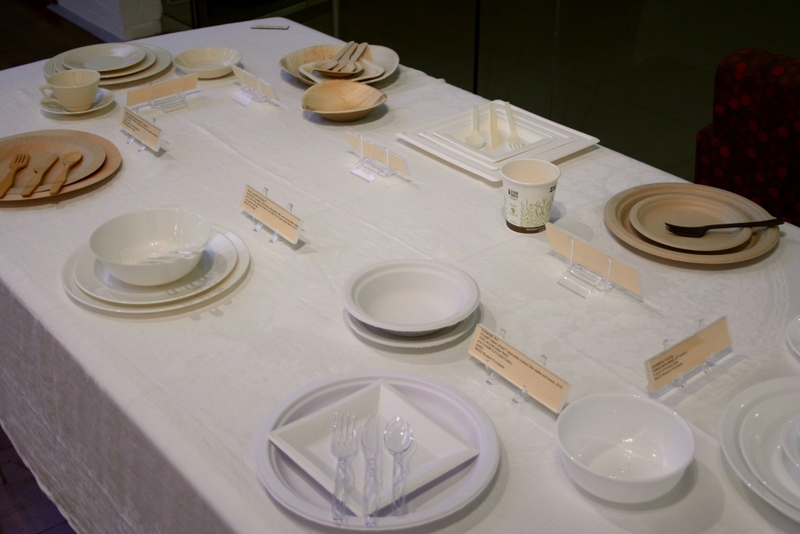 While these ceramic and glass products seem like an environmental positive alterative to disposables, there have been studies conducted that have shown that while plastic comes from petroleum and paper from trees, all of these types of dinnerware have to be manufactured, transported, and disposed of, all of which creates pollution. Additionally, there has been at least one study that concluded that the environmental impact of ceramic plates was 5 times that of the biodegradable plates (depletion of fossil fuels). 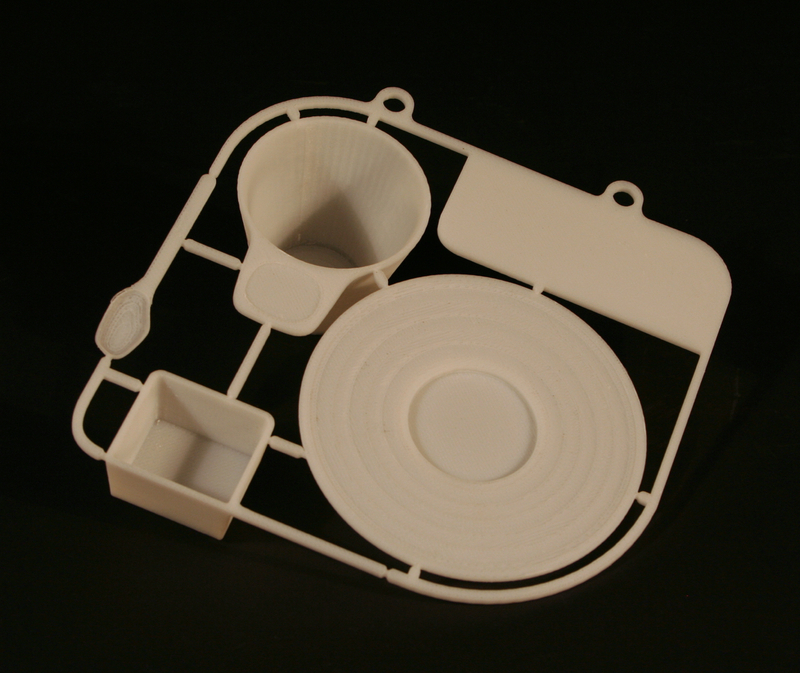 The ceramic plate needed to be used and reused a minimum of 50 times to have less impact on the environment than a single use biodegradable plate (https://sustainability.tufts.edu/wp-content/upload/LifeCycleAnalysisPlasticPlatevsCeramic.pdf). 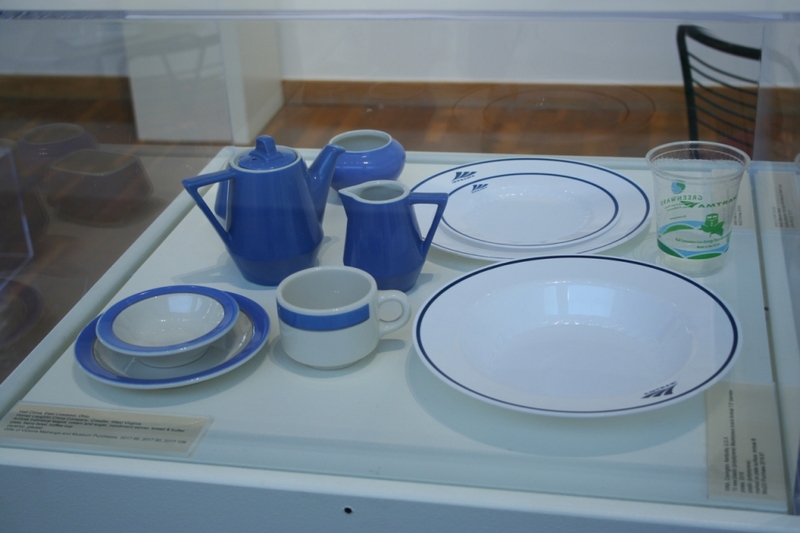 The environmental debate between the use of ceramic vs. plastic disposable dishes, can also be discovered in this exhibition by comparing Amtrak dining implements past and present. Side-by-side, which is more desirable? – the Amtrak individual blue and white ceramic teapot, cream and sugar or the plastic polystyrene Amtrak plates and bowls and plastic Greenware drinking cups made from plants. Current innovations in single use dinnerware focus on edible alternatives. Bakey’s, located in Hyderabad, India, introduced edible cutlery in 2013. A report in 2016 noted that in the U.S. 40 billion pieces of plastic cutlery are used annually. 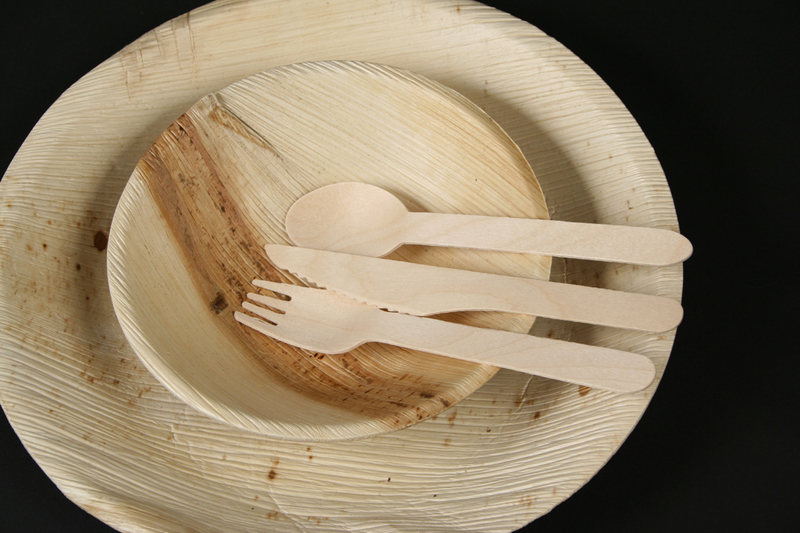 Bakey’s reported that an estimated 120 billion pieces of disposable cutlery are thrown away in India each year. Bakey’s was founded in 2008 by Narayana Peesapaty as an environmentally friendly alternative. His edible cutlery is comprised of a mix of millet, rice, and wheat that can be combined to form sturdy cutlery. They work fine even with hot food, and don’t get soggy. And each piece will decompose naturally within 4 to 5 days. But since it is 100% edible, available in sweet, savory and plain flavors, there is no need to discard it. If you knife breaks in your soup bowl, it becomes a cracker. It is more expensive to produce than plastic, and that is the biggest obstacle. There is no fat in these Bakey’s products. 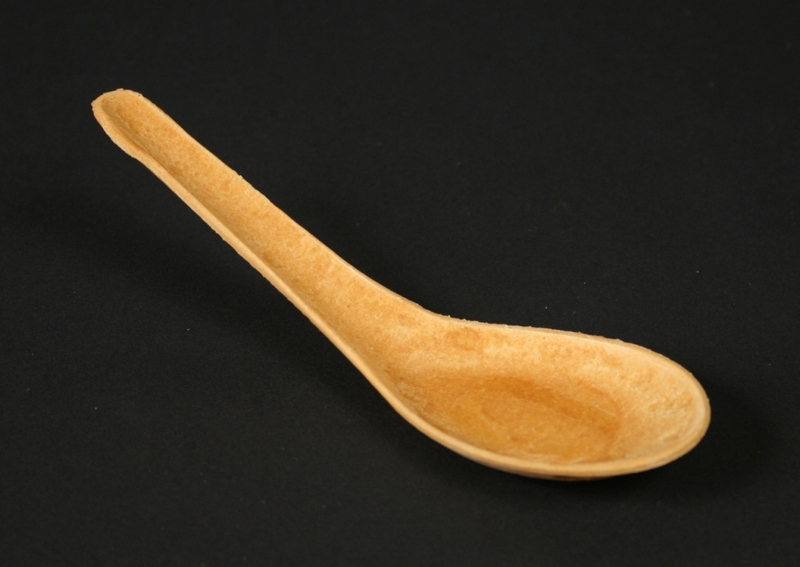 The edible spoons from Puerto Rico, called Bocado, also included in this exhibition, contain butter, along with wheat flour and salt. LOLIWARE makes what they call “biodegr(edible) cups” that are edible disposable cups that are “plastic-free, gluten-free, gelatin-free, BPA-free, non-GMO, all natural, non-toxic, safe, and FDA-approved. The cups displayed are Yuzu Citrus. They are made from seaweed, organic sweeteners and flavors and colors derived from fruits and vegetables. 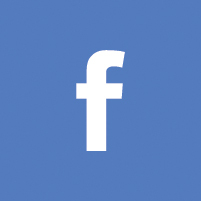 This is a company to watch. 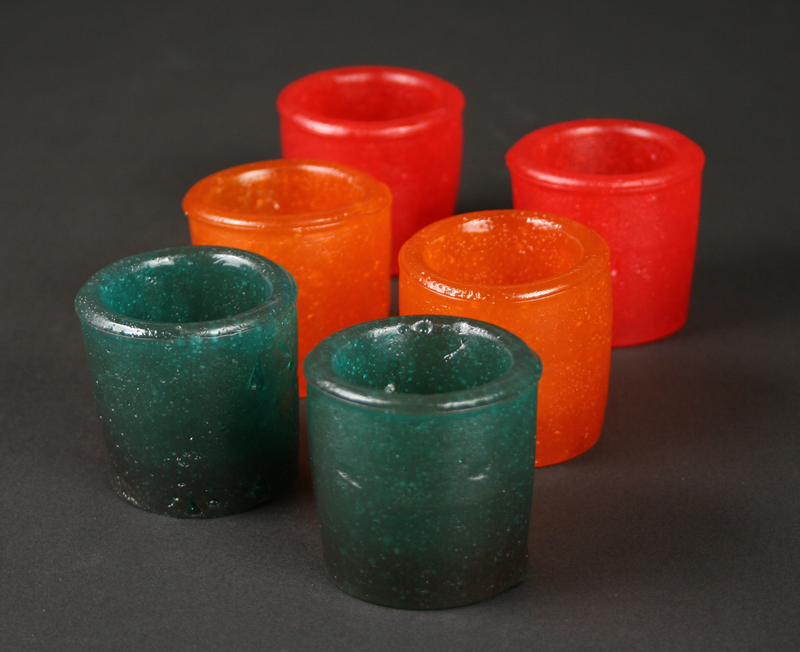 Related, but not the same, are edible Gummy Shotz shot glasses. Yes, like gummy bears, but shaped like shot glasses. What will they think of next? Corn syrup and sugar are the first two ingredients listed on the label. Then comes gelatin. 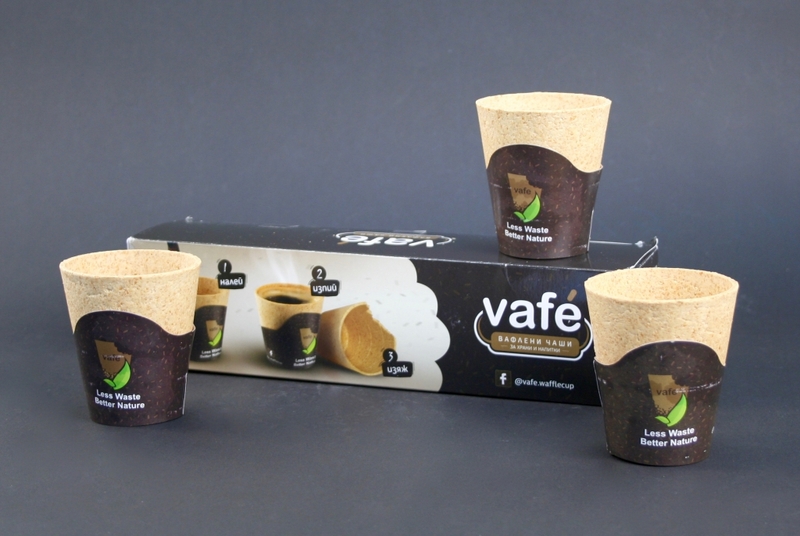 Vafe is your replacement for single use coffee cups. Designed and manufactured in Bulgaria by Revolucia, these are edible waffle coffee cups. Their marketing team cites the fact that 7 million disposable cups end up in landfills in England IN ONE DAY. They note that this is nearly as much as Bulgaria’s entire human population. The cups are made of oat bran, wheat flour, coconut butter, sugar, gluten, and sodium alginate, xanthan gum, and agar agar. Alcohol and the consumption of alcohol have inspired several edible disposable dinnerware items featured in this exhibition. 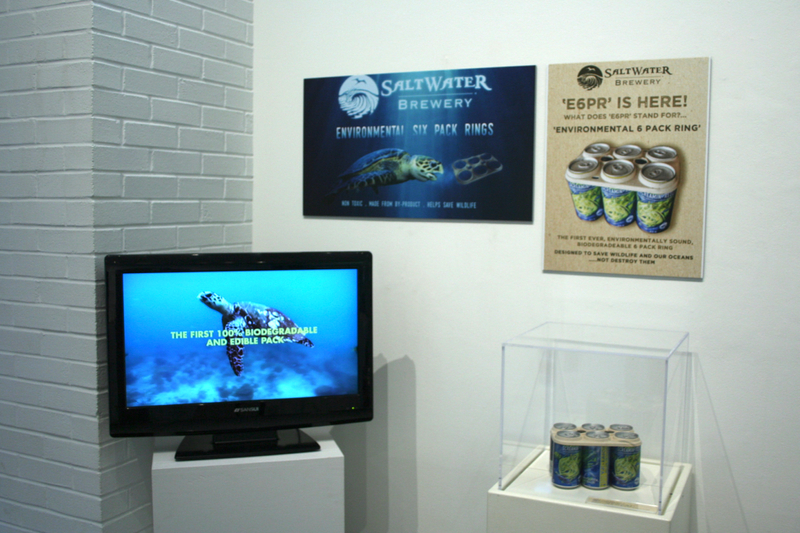 In addition to the edible gummy shot glasses, and edible sake bottles made from a dried squid’s body, there is the aforementioned Eco edible six pack rings that Saltwater Brewery in Delray Beach, Florida has utilized to replace the plastic six pack rings that were devastating to wildlife and to the environment. This creative approach to sustainable beer packaging is 100% biodegradable and edible. Constructed of barley and wheat ribbons from the brewing process, it can be safely eaten by animals and marine life. A brief video accompanies this installation. Sure to be a favorite among exhibit viewers and future consumers, are the environmentally friendly HyO-cups made from gourds that are grown in 3-D printed molds. 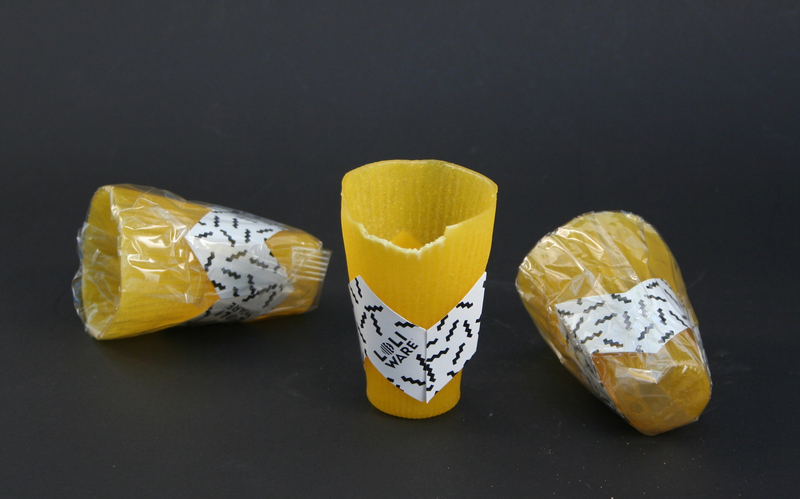 The prototype cups were developed by the Brooklyn-based design studio Crème Design under the leadership of Jun Aizaki. Some innovations in dinnerware, may win design awards, but remain prototypes, unavailable to the consumer. Featured in Unapologetic Dinnerware: a brief history of disposable dinnerware, are several examples, including the pop-up tableware designed by Yew Siang See in Malaysia; German designer Nils Ferber’s Fukushima plates that were designed to detect radiation in your food; in Amman Jordan, designer Sahar Madanat Haddad and his Product Design Novation Studio created Plate-Oh! 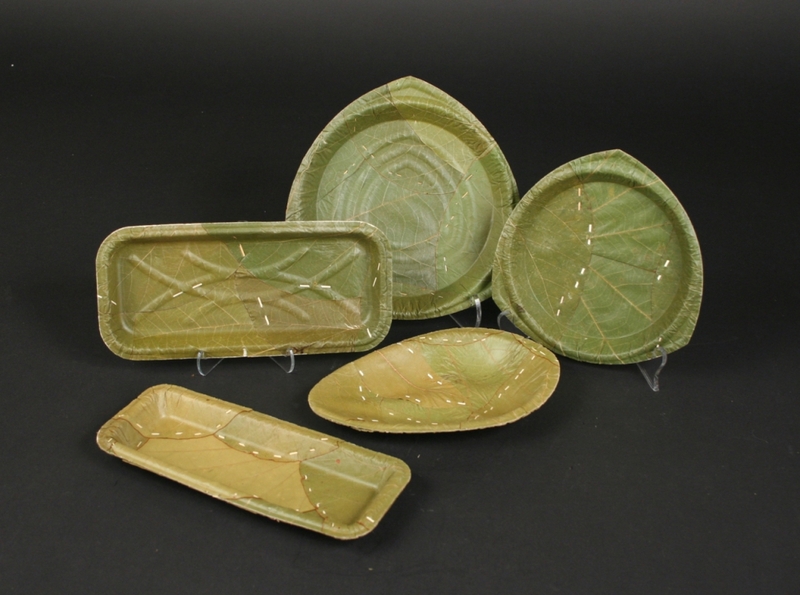 disposable plates which are a biodegradable plate with a unique construction made of individual layers pressed together. The user can peel off the used upper layer, revealing a clean plate underneath. It lasts for up to ten uses. 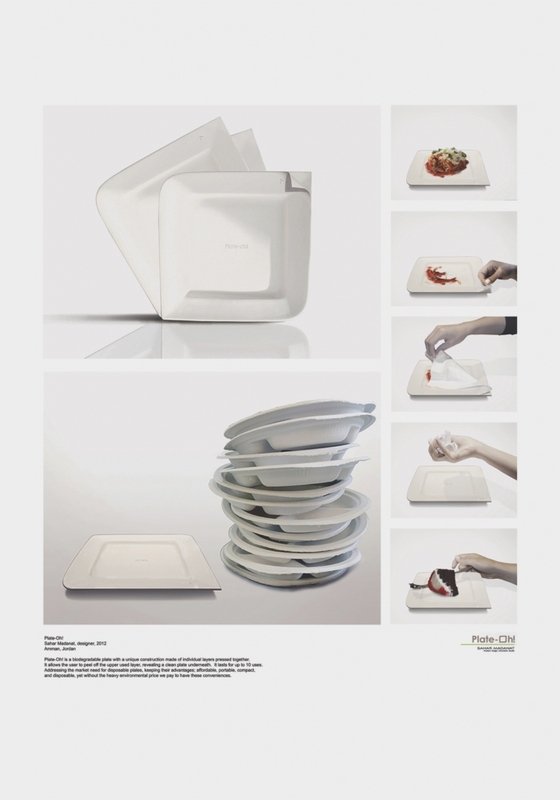 Portuguese designer Joana Carvalho created a Kit Café prototype in 2009-2010. Looking a bit like a model airplane kit from the 1950s, where you break off the cup, saucer and spoon from the molded frame, her intention was to make the product biodegradable, even including a coffee bean that could be planted in the ground in the used coffee cup, to perpetuate the cycle. The little spoon would play the part of the trowel. The example on display was created out of plastic and was 3-D printed. 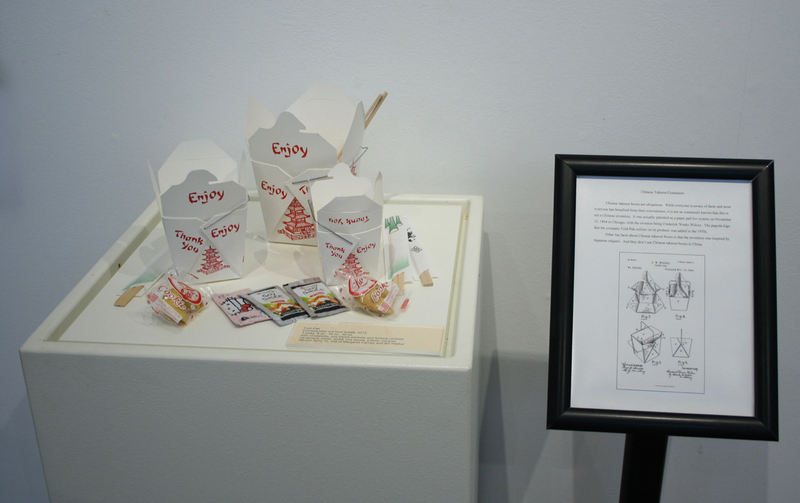 The exhibit additionally features the ubiquitous Chinese take out boxes, which are not only not from China, but originally were patented as “oyster pails.” Actually patented on November 13, 1894 in Chicago, the inventor was Frederick Weeks Wilcox. The pagoda logo that the company Fold-Pak utilizes on its product, was added in the 1970s. Additionally, the viewer will be captivated by the display of disposable Japanese ceramic trainware. Perhaps the most adorable disposable dinnerware objects in the exhibition are the circa 1960s Japanese disposable/reusable pagoda-shaped trainware teapots with lids that serve as tiny cups (kisha dobin). According to Louise Allison Cort, curator of Asian art at the Freer Sackler Museum in Washington, D.C., these small train teapots were an important product from the late nineteenth century to the mid-twentieth century. They were sold from trays on train station platforms. The first were produced in Shigaraki. The group on display are of later origin and were not hand made, but rather produced by slipcasting in molds. Also made of ceramic, in this case terracotta, are the single use disposable earthenware kulhar from India. Kulhar are traditional handle-less terracotta cups from North India and Pakistan that are typically unglazed and undecorated and meant to be disposable. Hot beverages such as tea are intended to be served in kulhars. An earthy aroma often accompanies its use. They may have been in use in the region for the past 5,000 years. There is currently a revival of the use of kulhars on trains in India. This action is not only to stop the use of plastics, but also to provide potters a useful revenue source. 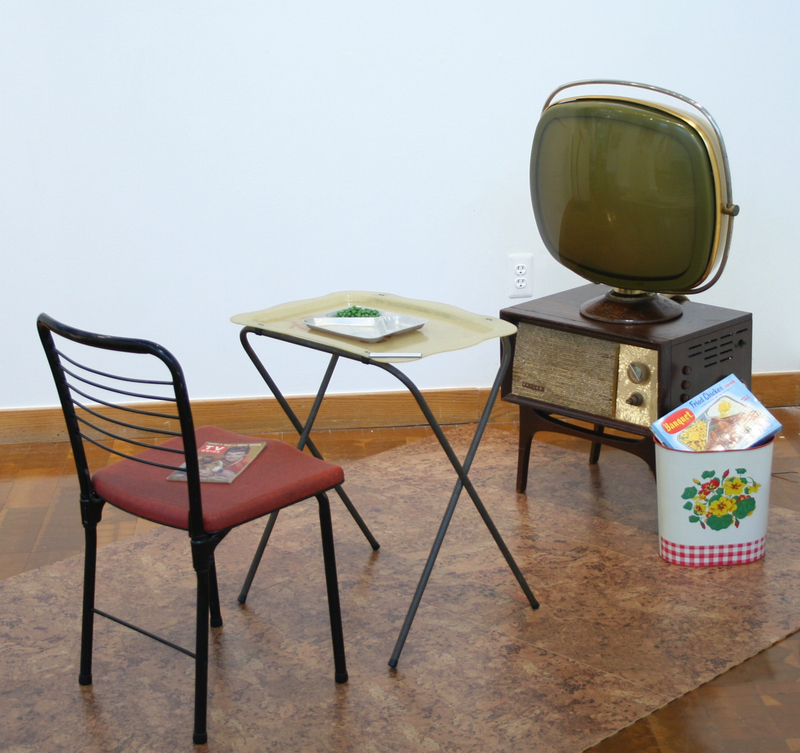 And don’t forget to take a nostalgic look at the TV dinner scenario complete with a Philco Predicta television from 1958 and a TV Guide featuring Lassie. The 1960s TV dinner looks mighty appealing. The need for innovations in disposable dinnerware is obvious. The oft-repeated statistics are staggering – landfills, and oceans, and the environment are strewn with plastics, Styrofoam and other hazardous materials that do not easily decompose. It’s unbelievable that more than 500 millions straws are used daily in the United States alone or that in India 120 billion pieces of disposable cutlery are thrown away annually or that 7 million disposable cups end up in landfills in England in one day. Even if these statistics are exaggerated, the need for safer alternatives is pressing. Disposable dinnerware is here to stay, whether in use in the food service industry or in our homes. Safer alternatives are being designed to meet these needs. This exhibition explores the history and the possibilities.